In my life before children, my home was minimalist sleek. Very little clutter and a place for everything. Three children later and of course that’s no longer the case, but a penchant for anything that keeps mess to a minimum makes these nifty bags a must. Created by a Seattle-based mum from a design handed down by her grandmother to her mother to keep Lego in check, Swoop bags are quite simply a great toy tidier. Made from strong cotton canvas which opens out to make a great mat for not only Lego, but all the other toys that seem to accumulate all over the house (soft toys in my case). Then when playtime’s over, simply swoop it all up into a handy storage bag – genius! They’re machine washable so you can pretty much use them for anything. 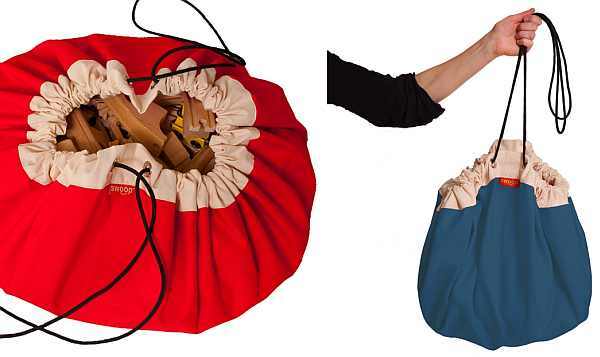 In a variety of colours, Swoop bags cost US$45 each. Contact Swoop direct for information on shipping.